Both are available with the standard Type A connector at one end and a Type B at the other – either the large square version or its tiny cousin. It's available in lengths down to 0.5m – a useful attribute as excess cable is the best way of picking up interference. Apart from the silver signal conductors, materials include high-density polythene dielectric, while the less-critical power cores and shield are made of silver-plated copper. The screen is a very dense braid and it is apparently both crimped and soldered to the connectors to improve integrity. The connectors mate cleanly and securely in the receptacles. 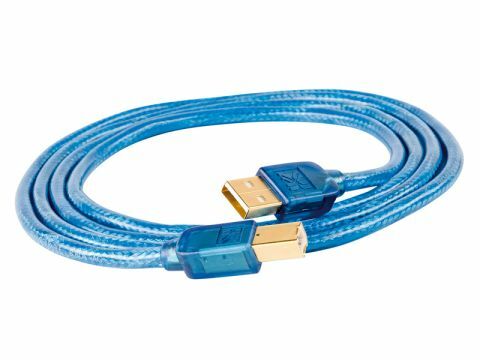 We found this a very effective cable allowing for the passage of clear audio to communicate through it, while maintaining excellent rhythm and timing, something that USB doesn't always seem to do very well. This was most noticeable with our resident Cambridge Audio DacMagic, which normally sounds distinctly more energetic using the S/PDIF connection than USB. With the Kimber cable in use, the gap was narrowed. Even with the superb Lavry DA11, which is unusually consistent between inputs, this cable seemed to give a small lift to the 'kick' delivered via USB. The DacMagic also benefitted from improved bass extension and solidity, again bringing its performance closer to the high levels attainable when using S/PDIF.